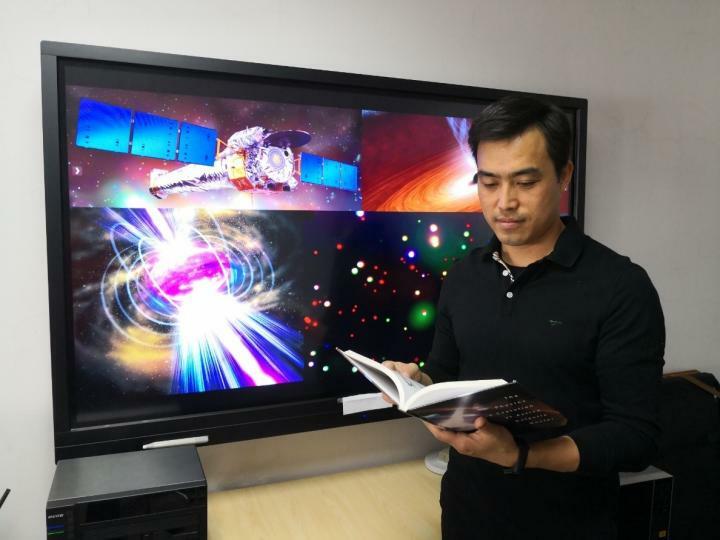 On April 11th, 2019, an international team led by Professor XUE Yongquan from University of Science and Technology (USTC) announced that they had observed a unique X-ray signal which is highly likely powered by a magnetar, as the aftermath of a binary neutron star merger 6.6 billion light years away. Such a signal was captured in the deepest and most sensitive X-ray survey – the 7 Ms Chandra Deep Field-South. This discovery was published on Nature. Neutron star is one of the most miraculous objects in the Universe, as a typical neutron star with a mass same as our Sun only has a radius of about 10 kilometers, in stark contrast to a radius of 700,000 kilometers for our Sun. Yet our grasp of the physics of neutron stars is still fuzzy. For years, astronomers had been wondering about the question: what is the ending of a binary neutron star merger system? A lot of researchers bet their money on the black hole interpretation, suggesting that the merged celestial body would collapse under its extremely strong gravity and become a black hole. While some believe that a magnetar, a fast spinning neutron star with an extremely strong magnetic field, which is a hundred million times of what human can achieve in laboratory, will be formed after the merging process and can survive its own gravity with the help of its powerful centrifugal force. After years of discussion, this time, the Universe finally gives her answer–evidence of the existence of a magnetar has been revealed! When two neutron stars “embrace” each other, the emission of gravitational waves–ripples in space and time occurs, along with a massive cloud of colliding debris traveling outward. Under gravitational pull of the merged magnetar, part of the colliding debris falls back inward and causes internal shocks, resulting in jets of high energy particles and intense radiation. If the jet is pointed to our direction, energetic explosions known as short gamma-ray bursts with a typical duration of less than 2 seconds will be observed, which has been taken as evidence of a binary neutron star merger for decades. Meanwhile, our leading role–an isotropic X-ray transient debuts. If a magnetar is formed after the merging process, this bright transient of X-rays will last for several hours and can be viewed off the jet axis by us. Therefore, even without any gamma-ray burst detected, an X-ray transient can also give us valuable information about the neutron star merger system. By contrast, if the X-ray transient is powered by a resulting black hole instead, it could shine for only seconds. Such an X-ray transient has been longed for by theorists and was not discovered till now. The signal is located in a galaxy 6.6 billion light years away from Earth and had lasted for as long as 7 hours. It indicates that a neutron star/magnetar can form as a result of a binary neutron star merger. Interestingly, the observed X-ray transient lies in the outskirts of its host galaxy, like binary neutron star systems usually do, since they are usually kicked away from the center after supernova explosions. This can be taken as supporting evidence that the X-ray transient is indeed powered by the binary neutron star merger. “The discovery of this new X-ray transient is highly intriguing. Particularly exciting, due to the discovery being made by Chandra with its excellent spatial resolution, is the ability to identify the host galaxy,” one reviewer of this paper said. Meanwhile, researchers also calculated the event rate density of similar X-ray transients. The result is consistent with the neutron star merger event rate density robustly inferred from the gravitational wave detection of a binary neutron star merger in 2017. This discovery has profound implications for the equation of state of the extremely dense nuclear matter: the neutron star equation of state could be sufficiently stiff, i.e., the pressure increases sharply as the matter density increases such that a supramassive or even stable neutron star/magnetar can survive the binary neutron star merger. It helps ruling out a series of theoretical nuclear matter models which are inconsistent with the observations, thus providing new insights into the physics of neutron stars.